It wouldn’t be Easter if you didn’t indulge in a Cadbury Creme Egg or Cadbury Mini Eggs. You can enjoy both (plus a whole other lot of goodness!) 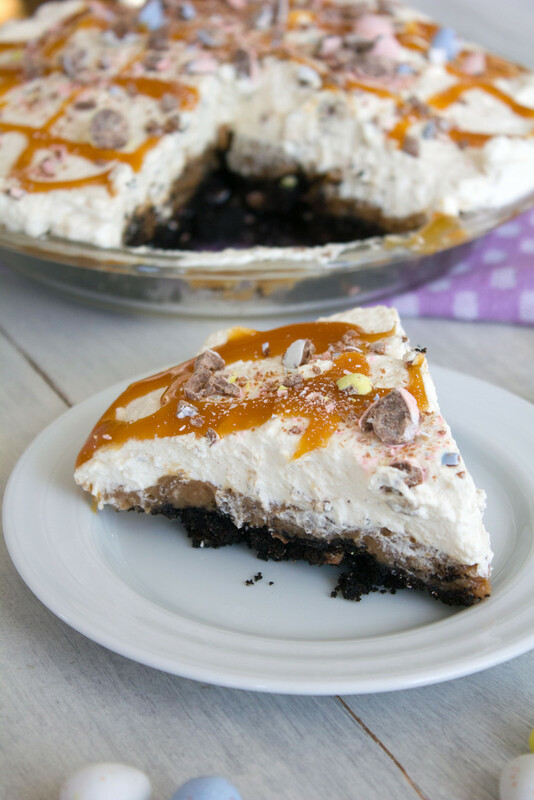 in this Cadbury Creme Egg Chocolate Cream Pie. I’m so close to vacation, I can taste it. I’m pretty sure it’s the piña coladas I can taste. But it might be some salt water. And probably a little sand, too. But I don’t even hate it. Because a week on the beach with a stack of books and food magazines and a drink (or 20) in my hand is all that matters. The whole no work thing doesn’t hurt either. But seriously, please tell me I’m not the only one who Googles phrases like, “how to stop anxiety about leaving dog while on vacation.” As excited as I am for our little getaway, I’m a huge gigantic wreck over leaving our little pup. And have been stocking up on way too many treats and toys that her sitter can give her while we’re gone. I’m terrified that she’ll think we abandoned her and will get seriously depressed and then hate us when we get home. I know… I’ve become a crazy person who considers my dog’s feelings before my own. But the show must go on. And short of smuggling my dog onto the beach, I need to take a deep breath and let it go. And probably eat a giant slice of pie… Because what better way to prepare for putting on a bikini?? But really, Easter is coming up and I can never ever let Easter pass by without a Cadbury Egg or Peeps recipe. You’re in luck because this year, it’s Cadbury’s turn (I realize some people don’t appreciate Peeps in the same way I do); And I’m going for a double whammy with both Cadbury Creme Eggs and Cadbury Mini Eggs in this recipe. Even better is that I made a glorious pie with the Cadbury Easter treats… On Pi Day! Coincidence or careful planning? You decide. 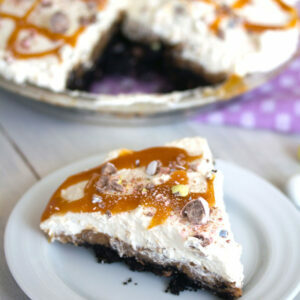 Or just simply enjoy this Cadbury Egg Pie. Cadbury Creme Egg Chocolate Cream Pie to be exact. The crust of the Cadbury Egg pie is made with crushed chocolate wafer cookies and Cadbury Mini Eggs. Did somebody say heaven?? And the filling is a sort of typical chocolate cream pie filling, but with Cadbury Cream Eggs acting as the chocolate. I mean, you can’t beat that! While there are quite a few different parts to this recipe, all are pretty easy to put together… And shortcuts can definitely be taken if you choose. Once the crust and chocolate filling are complete, the pie needs to chill for a few hours. I took that time to whip up an incredible caramel whipped cream. Again, I made my own caramel sauce, but store-bought would totally be fine. Just don’t skip the caramel because omg yum. If you only eat one Cadbury Egg and 1 (bag) of Cadbury Mini Eggs this year, please let them be in this Cadbury Creme Egg pie. But who are you kidding… You’re going to eat way more than that this year! I momentarily considered adding Peeps into this pie somehow, but I held myself back. In case you haven’t noticed, I have a bit of a tendency to go a little overboard… Especially when it comes to sugar. And marshmallows. And marshmallows covered in sugar (see… THAT is why I don’t understand how people don’t like Peeps??). And this Cadbury Egg pie was already the perfect amount of overboard. 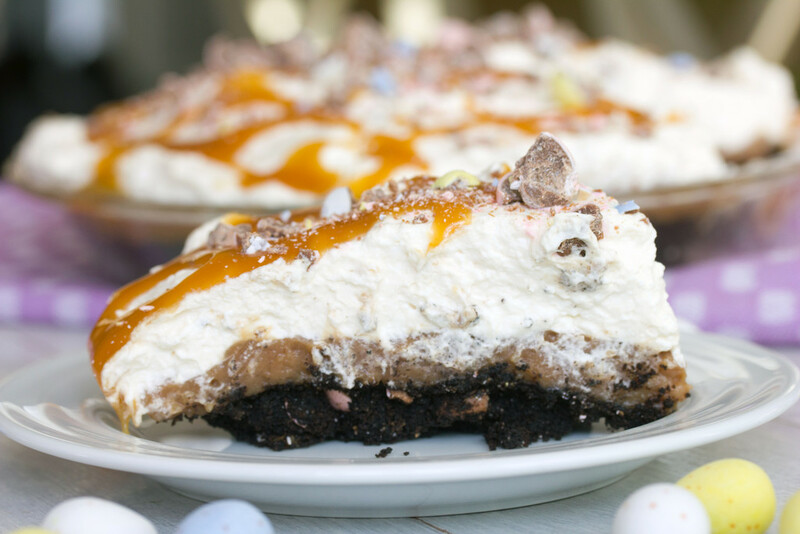 Two kinds of Cadbury Eggs, chocolate crust, whipped cream, and lots of caramel. If the Easter Bunny were like Santa and you were supposed to leave him treats, I’d totally recommend making him a Cadbury Egg pie. Similarly, if there was a Pi Day mascot who came to visit you at night and liked treats, this would be perfect. On that note, why isn’t there a Pi Day mascot? Because that would be totally creepy, I guess. Just answered my own question. Math was never my greatest subject, but I can get behind a holiday that combines math with food. I probably would have enjoyed math a lot more if it related back to food in school. Once I got to college and took logic for my math fulfillment, I realized I was really good at it because it’s math with words. And words I understand. Math with food I would have been even better at! Or perhaps I’d prefer just sitting here and stuffing my face with this pie on Pi Day, basking in the knowledge that I never have to take a math test again. And that I’m married to someone who is smart in math (one of my greatest fears has always been having my someday children coming to me for math help). If I eat three slices of this Cadbury Egg pie tonight, I’ll still be OK when I have to put a bathing suit on next week, right?? Right? Are you a Cadbury Egg fan? Which type do you prefer? If you’re looking for more Cadbury Egg desserts, be sure to check out my Cadbury Mini Egg Scones and my Cadbury Egg Milkshake. 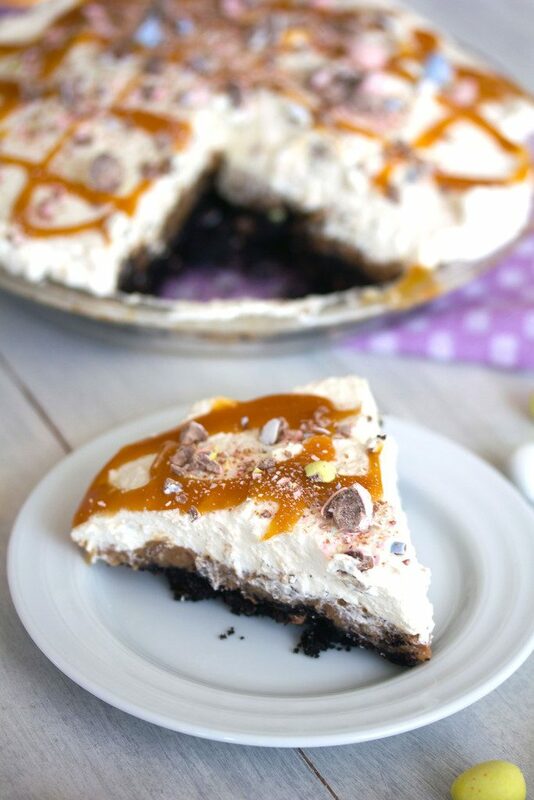 I also love this No-Bake Mini Egg Pie from Fresh April Flours! It wouldn't be Easter if you didn't indulge in a Cadbury Creme Egg or Cadbury Mini Eggs. You can enjoy both (plus a whole other lot of goodness!) 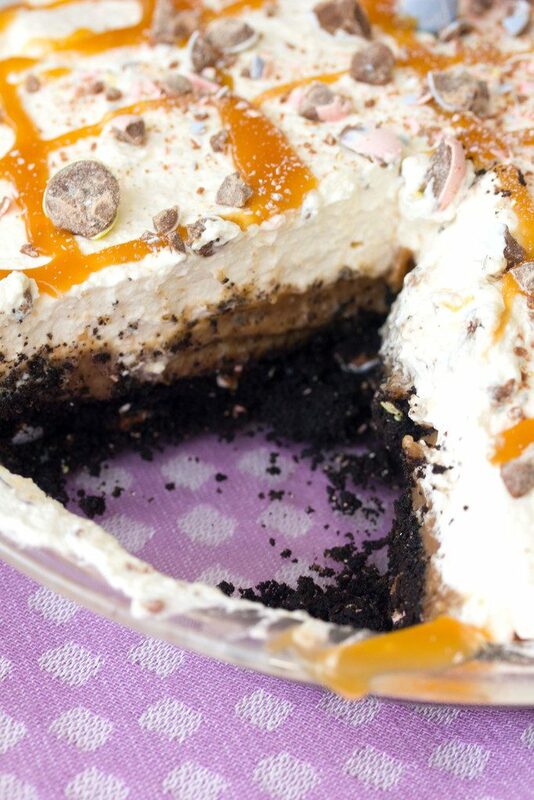 in this Cadbury Creme Egg Chocolate Cream Pie. Heat milk and 2 Tbsp sugar in a medium saucepan, until just about to boil (bubbles will be forming at the edges of the saucepan). In a large bowl, whisk egg yolks with sugar, cornstarch, and salt. Slowly whisk hot milk mixture into egg yolk mixture and then pour the combined mixture back into the saucepan. Place over medium heat, whisking constantly, until mixture gets very thick and custardy, about 3 minutes. Remove saucepan from heat and stir in chopped Cadbury Creme Eggs. 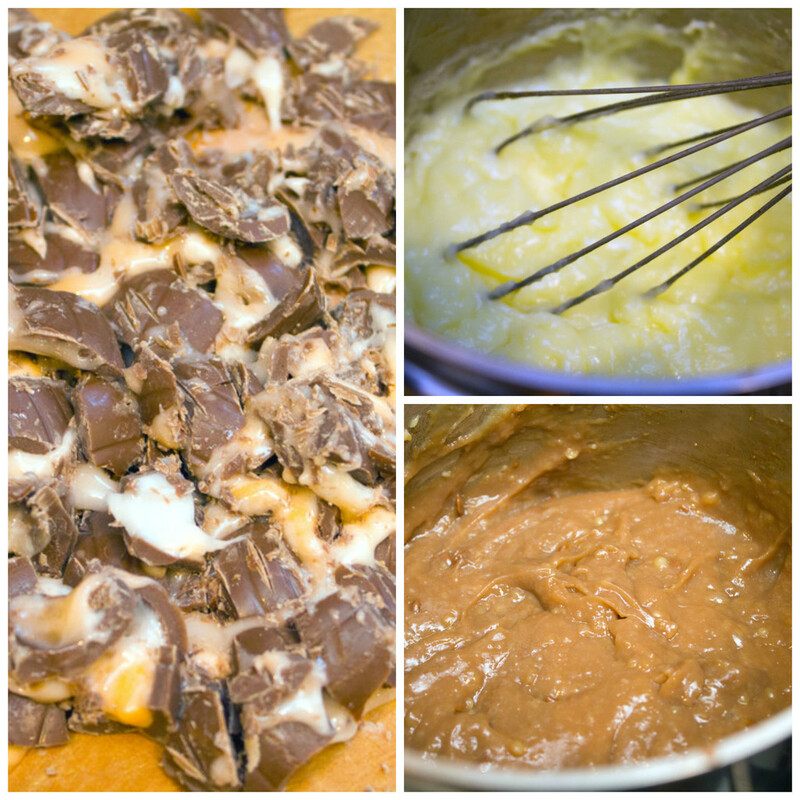 Whisk until chocolate is completely melted and mixture is smooth. 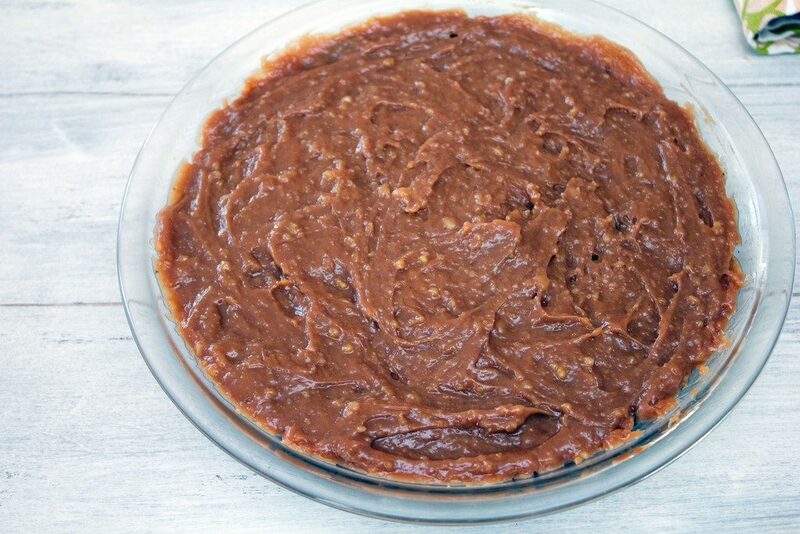 Pour chocolate mixture into prepared chocolate pie crust. Smooth top with a spatula and cover with plastic wrap, so plastic wrap is touching the top of the pie filling. Refrigerate pie for at least 3 hours to cool completely. Once cooled, top with caramel whipped cream. Drizzle additional caramel sauce on the top of the pie, if desired. Place chocolate wafer cookies in a food processor and blend until chocolate crumbs are formed. 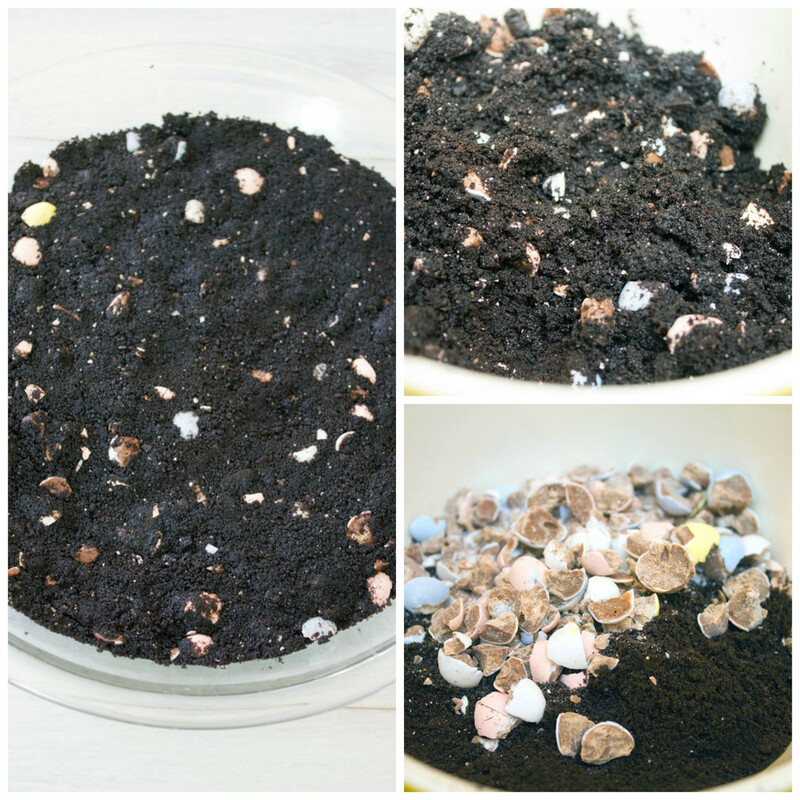 In a medium-sized bowl, mix together chocolate wafer cookie crumbs, crushed Cadbury Mini Eggs, melted butter, and salt. Pour cookie crumbs into the bottom of a 9-inch pie plate and press down along bottom and sides of dish. Bake pie crust for 8 minutes. Remove from oven and let cool completely. In the bowl of a stand mixer or in a large bowl with a hand mixer, whip cream until soft peaks form, about 2-3 minutes. In a medium-sized saucepan, heat granulated sugar over medium heat. Stir frequently with a rubber spatula until sugar turns into a smooth light amber-color liquid. Stir butter into sugar, for about 1 minute, until the butter is completely melted. Stir the heavy cream into the mixture and let it come to a boil. Remove the saucepan from the heat and stir in salt. Pour the mixture into an airtight container like a mason jar or bowl. Store in fridge until ready to use. 15 Responses to "Cadbury Creme Egg Chocolate Cream Pie"
I have a beach vacation coming up too, and I can barely stand the wait. I just want to chill in the sand and drink frosty drinks! This pie is the best!! What a fun pie! Love the chocolate and cadbury eggs! I am away most of April and suffer cat-anxiety while gone – worrying about them. This pie would certainly go a long way to alleviating that! That crust is amazing. I love the mini-eggs – hard to come by these days. I do confess, I am glad you left out the peeps! Thanks for the reminder about Easter – forget it’s so close when it’s only mid-March. Ohhh! I am so with you, my friend! The idea of leaving our puppy this summer already has me feeling tiny pangs of anxiety! You’ll have to tell me how yours does while you’re away! This pie – oh my! So cute and decadent. I haven’t had a cadbury egg in the longest time – and now I miss them! I need to make this pie! PS) Have a great time!! This is the perfect Easter pie! I love Cadbury mini egg so much. This is such a delicious, creamy pie! I love the different layers and tastes! This looks perfect for Easter! I love cadbury creme eggs! Hope you have a great vacation! Totally jealous you are going on a vacation!! But I hope you have loads of fun! 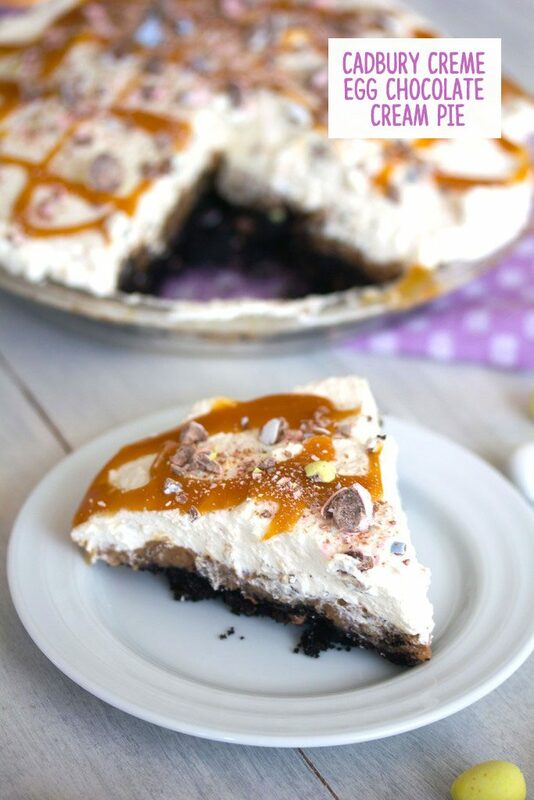 I will just have to sit at home and eat my feelings with this fabulous cadbury creme egg pie! LOVE this, girlfriend! All sorts of perfect for Easter… or just for me. 😉 Cheers! You are so utterly brilliant! This is so creative and looks absolutely delicious! Perfect for Pi Day, Easter, or any day 🙂 Hope you have a great trip! I’m so jealous you are going somewhere warm and tropical! Have a great vacation. I wish I could dive right into this cream pie. I love that you made a pie with Cadbury Creme flavors! My dad is seriously OBSESSED with cadbury eggs…like stocks up with 50 bags every Easter season. So this reminds me of him and makes me smile :). Not to mention is looks mouthwateringly delicious! Pinned!